Holden crater's wide floor, shown in a newly released image, has abundant layered sediments, channels, and large piles of debris at canyon mouths. These suggest a long history of deposits by water. Editor's Note: This article was originally presented by the Mars Odyssey's Thermal Emission Imaging System (THEMIS) team at Arizona State University. It is reproduced here with permission. At the THEMIS site, you can zoom in on this new image. NASA's next Mars rover will be the Mars Science Laboratory (MSL), due for launch in 2009. 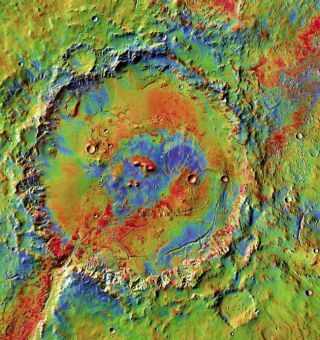 In hopes of hitting paydirt once again, NASA has scientists scouting for landing sites that might extend the Martian water story beyond Opportunity's glimpse at Meridiani. Holden's wide floor, shown in a newly released image, has abundant layered sediments, channels, and large piles of debris at canyon mouths. These suggest a long history of deposits by water. And in Eberswalde Crater, just north of Holden, scientists have spotted what is surely the remnant of a river delta. Uzboi Vallis breaks Holden's rim in its southwest quadrant, where water flowing through the valley dumped layered sediments on the floor. As scientists reconstruct it, after the Holden impact, water flowing down Uzboi cut through the rim and spilled into the crater, depositing sediments on its floor [Image].